U.S. 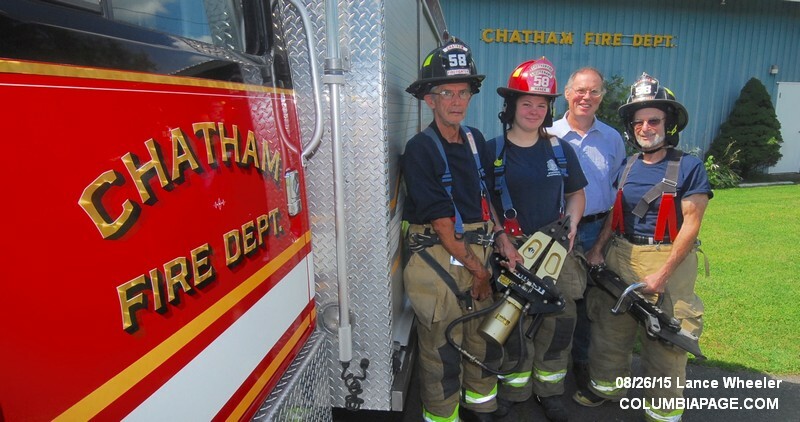 Senators Charles E. Schumer and Kirsten Gillibrand today announced $22,368 in federal funding for the Chatham Fire Department in Columbia County. This funding was allocated through the Department of Homeland Security's Assistance to Firefighters Grant (AFG) Program. Specifically, this funding will be used to purchase a new extrication tool set, including cutters that help first responders quickly remove victims from enclosed spaces quickly. This system will help them replace their current 30-year-old equipment. “This is a tremendous aid to a small community and surprisingly, the town fire department extraction equipment is used quite a bit. The Chatham Fire Department is responsible for several thoroughfares, including the Taconic Parkway and several other highways where many accidents take place. This equipment, unfortunately, sees a lot of use,” said Assistant Fire Chief Eric Barnes. Left to right ~ Firefighter George Lucas, Captain Courtney Haner, Mayor Tom Curran and Firefighter David Levow.